Algerians in London tell Bouteflika. 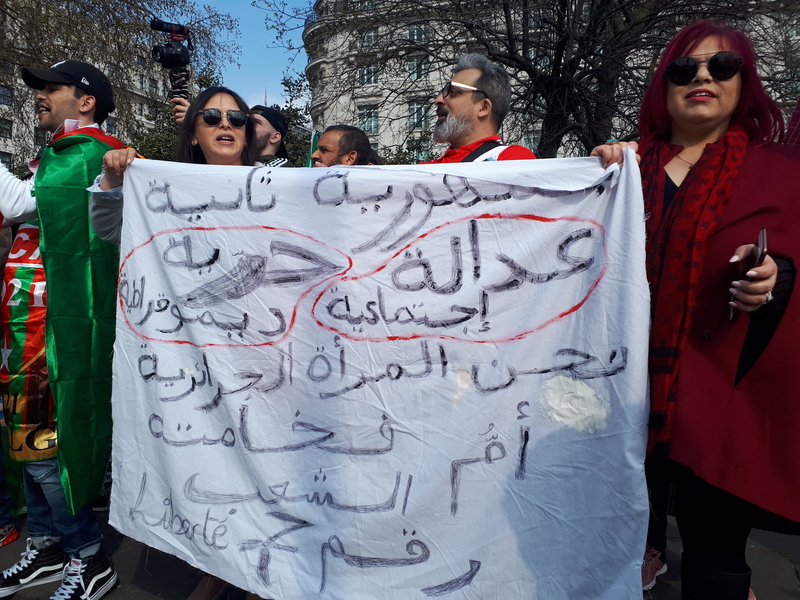 For the sixth week in a row, hundreds of Algerian activists from around the UK joined lively protests in central London in solidarity with the unfolding mass movement in Algeria. After rallying at Marble Arch, they marched down Oxford Street flanked by a convoy of mopeds carrying banners and Algerian flags. Crisis has gripped the Algerian ruling class since protests erupted in February in protest at the decision of ailing President Abdelaziz Bouteflika to stand for a fifth term in office. Following weeks of huge demonstrations and strikes, Bouteflika has said he will not stand again, but remains in office, naming a new cabinet on Sunday 31 March. Middle East Solidarity spoke to organisers of the London protests, Linda and Rabia, about the demands of the movement in Algeria and the goals of the weekly demonstrations in London. “We have no political or financial links to any side, we are completely free, we are the voice of the people in Algeria”, Linda explained. “They want the corrupt system to change, and we are helping them to organise peaceful protests.” Demonstrators in London are closely following the movement on the streets of Algeria over social media, and adapting their slogans as the movement in Algeria develops. “The demands are changing depending on the political situation”, Rabia said. “For example on 22nd they were protesting against a fifth term for Bouteflika, then on the 3rd they were demonstrating against Bouteflika having another year in power, then we were saying we don’t want a government chosen by the government”. Many Algerians are wary of the role of the army, Linda told us. General Gaid Salah, the Algerian chief of staff, is reported to be in favour of removing Bouteflika through a “medical coup”, relying on article 102 of the constitution which allows the president to be removed from office if medically unfit. Rabia is another of the volunteers who have given up every Saturday for the past six weeks to organise the London marches. He also told us that protesters didn’t trust the generals’ intentions. “Last week, the general Gaid Salah said we need to use article 102 from the Algerian Constitution to remove Bouteflika on medical grounds, but this is illogical, why did they not apply it seven years ago when he first got ill? That’s why we are thinking that this general has some relationship with Bouteflika and all those people in power. The mass movement is making many people in Algeria raise demands for deeper social change, Linda said.